space has added an amazing feature, the Room system! The room system allows you to create your own region in Sinespace which you can then make into your own room, to use personally, or sell on the Sinespace store. We have a video tutorial for making the Room templates here and you can also see the guide to the Room System here. To edit your room, go to your room by clicking on the 'Home' button at the bottom of the screen. Once in your room, click on the 'Edit Room' button. This will bring up the Edit Room UI. The Edit Room UI has a ton of different tools. This is where all of the furniture items you have are stored. You can click on a item in the inventory, and this will be spawned in the room. This will select the furniture item you click on in the room. This is the first rotate tool along the top, it'll rotate easier to grab handles focusing more on overhead rotation, allowing for stuff like furniture placement to be rotated, without necessarily grabbing the object in 3D and rotating all over the place randomly. This is your standard translate tool, you can hold CTRL while moving to move along a 1m grid. The 3D rotate tool lets you rotate both in the 3D space, using the X,Y and Z handles, and also lets you rotate in screen space. If you hold CTRL while rotating, it will look changes to a 15 degree angle. Scale sizes items up and down if you scale using the middle white box on the gizmo, or, you can grab the other handles individually to scale along the X,Y and Z axis. If you hold CTRL while scaling, you can lock the scaling to multiples of 100. Ceiling - This will lock the camera to the overhead ceiling that is built into the room by the room designer. If you use the arrow keys, you can pan the camera, or you can move the mouse cursor to the edge of the screen. Fly Thru - This is a free moving camera. Hold right click, and use the W,A,S,D,E and C keys to move the camera about manually. For building scenes this is often the best mode to use. Avatar - This will use the normal camera view behind the avatar. Snap controls how the object will be moved underneath you - this is a on/off toggle. When there is a blue tick, this indicates that snap is on. If the furniture has 'snap nodes' built in, the object will lock together as the designer intended. Align is defaulted to be switched off, but if you turn it on, when you're dragging or placing furniture, this will try to align objects to their nearest other object (or scenery component). This is useful if you want to place a sofa in line with a wall. if this is set to global, the widgets on the movement/rotation/scale tools, will be aligned towards the scene; so the 'Y' axis will always point upwards vertically off the ground. If you turn it to local mode, it'll be pointing towards the rotated upwards on that model, so if you rotate the model, the widgets will point in different directions. This will mean that the gizmos will be emitted from the center of the mesh. The alternative mode, Pivot, which is the pivot point defined in the object, will set the gizmos to the objects pivot point. This is where you can switch to a different template for your room. You can buy new templates in the Shop under the Room tab. Note, when you swap storefront, it will erase the contents of your room You may instead, want to make a new region (from the main UI, click 'Home', then 'Create new region'), and edit in there - additional regions are free. This is where you will see a list of all the material you have purchased from the Shop. Material can be bought from the Shop under the Furniture tab. You can click on the Material you want to use, and it will show on the floor or ceiling, depending on which one the material was made for. The lights button lets you control lights embedded in the region - set their colour or change their brightness. the options button is a free-form area for creators to embed configurable options; such as 'shutters down' or 'door open/closed', etc. What the items are here here for example shutters, is defined by the creator. This allows you to switch from one area in a region to another, so you can place furniture in different parts of the region. This will show you a list of all the objects you have in the region. We don't save by default, so this is worth noting (we'll add a popup in a future viewer if it isn't in there already). The save button is used to save your changes, but if you don't like what you've done, you can logout and come back, and it'll return to how the region looked before you edited the room. This will undo the last change you made. Redo will redo the last change you undid. This will duplicate the object you have selected. This will delete the object you have selected. This will deselect the object you have selected. To place furniture, all you have to do is click on the furniture object in the inventory, and it will spawn in the region. You can choose to use the 'Switch' button if you want to place the furniture in a different area of your region. Once the furniture has spawned in the region, you can move it around with the above mentioned tools, and decorate as much as you want! if you're holding the alt key, the furniture will place on the closest surface below the cursor, if you do not have the alt key pressed, it'll place it on the floor instead. 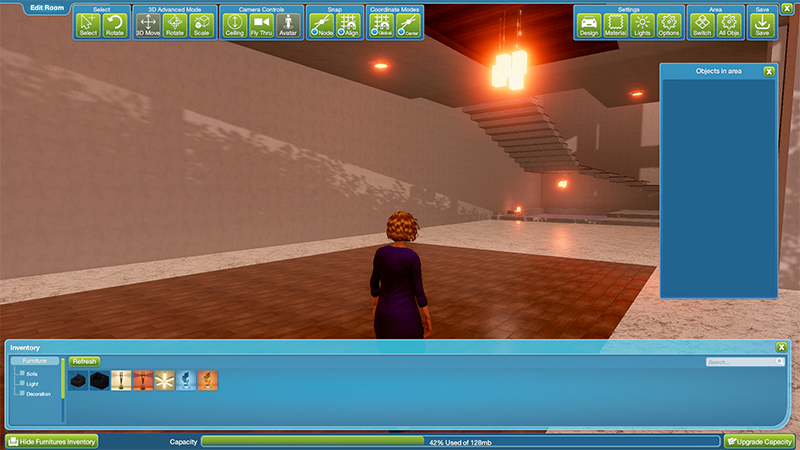 By default, every room has a list of placable surfaces in it, defined by the template creator. This may not be optimal - if you're placing something on top of a table for example, then you want to hold the alt key so they align. If you hold down Shift while placing, it'll also ignore the Snap and Align modes, as if they're switched off. W: Pressing the W key will switch the mode to Move. E: Pressing E will switch the mode to Rotate. R: Pressing R will switch the mode to Scale. CTRL+LMB (Left mouse button): This will snap the selected object to grid. CTRL+Z: This will undo the last action. Shift+Delete: This will delete the selected object.